The grand repainting of the chaos army has begun. I have 27 "plague marines", which are basically converted nurgly marines. 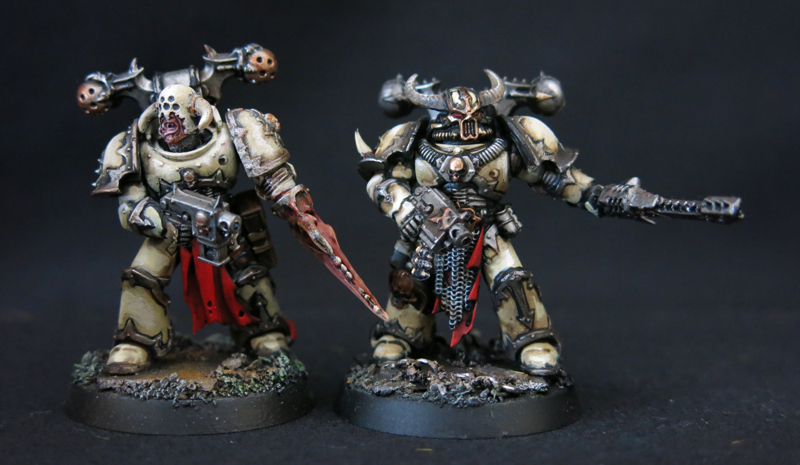 These guys will likely be the rank and file, so they are getting the 'downgrade' to regular chaos marines with the Nurgle Icon. Because.... well.... I like dead things. Everybody started off dark brown, then I did the rust, then the green, which was washed darker. Here's the 'finished' test marine. Likely to be some detailing, yet, but he's the painting guide for the rest. I've got 10 on the table at the moment. I've also realized I need to do some icon bearers, which will actually be icon backpack bearers. I'm figuring the power of the icon should do some mutating, so they will be fun conversions. Otherwise, I've only had to add a couple heavy weapons guys to make the marine contingent viable. They should be done just about the time the new codex comes out and makes me reorganize them. Here's the first of the powerfist wielding champions. because, who doesn't like a powerfist? He's still very much painting in progress. After my last game (vs. tyranids), I decided I needed dice for this army, since using the ones that had worked so well for my loyalist Raptors did NOT work out so well for my nurgly guys. 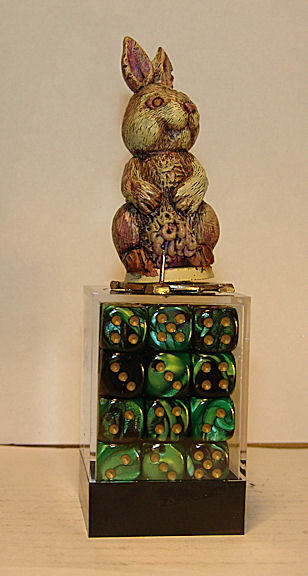 So here, we have the Plague Bunny (Still pip) sitting atop my ancient Chessex Chaos pin, blessing the new dice with chaosy goodness. All the 6 sides are facing up to absorb the taint. But seriously.... I'm not superstitious at all. Now.... I just have to fight the urge to buy any of the new flyers and save my hobby $$ for the 6th Edition rollout. THAT.... is no where near as easy as it sounds. Holy CRAP! I actually kept my deadline?!?!?! The new "Occupied" comic is up for those interested. CHECK IT OUT HERE! Pictures of my Nurgle marines upcoming. Probably later tonight, so keep an eye out. Here's the finished Russ. 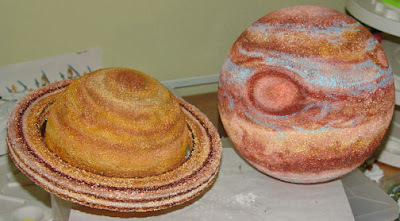 I learned quite a bit about my weathering powders. Mostly through what NOT to do. But I'm pretty happy with the results. Knocking off the Rust: The Templars of DOOooom! "I'll get you, ya dirty bug! WARPTIME!!! Wha...the...NOOooooo *blink-pop*"
My Chaos army had an outing at the local gaming establishment today. 1500 points against my Tyranid playing painting protege', Broodnest. As usual, I lost, but almost more to my own dice than those nasty bugs. 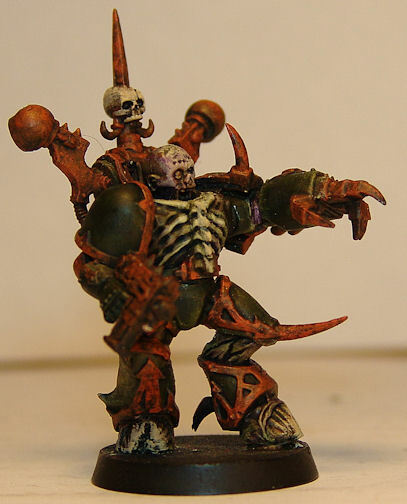 Two plague marines blew off their own arms/heads. And my Deamon prince failed a psychic test, suffering his final wound to Perils to the Warp... thus effectively killing himself. Oi. So I bought a new brick of dice that will be dedicated to the Old Gods, since the ones I used had been giving me moderate success with loyal marines. The corpse Emperor put a voodoo whammy on those dice....I just know it. American Idol is on tonight and tomorrow, which means I'll be hiding in my art room painting away. 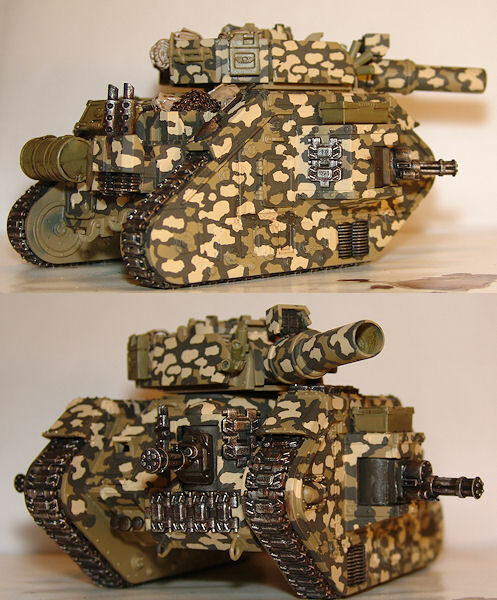 So, there will be pics up of the Russ and the new Templars of DOOooom paint scheme. My Devil Dog won second place in the Boot Camp Camo contest, so that was nice. And I'm posting my ribbon graphics here so I can post them there, because I'm still kind of clunky at all this blog posting stuff. If you have any interest in things Imperial Guard, Boot Camp is a great forum. Some of the conversions and plasticard work some of these guys do is just sick....in a good way. Its also a great place to get a taste of the international view of the hobby. CHECK it out! New Comic and something Nurgly. 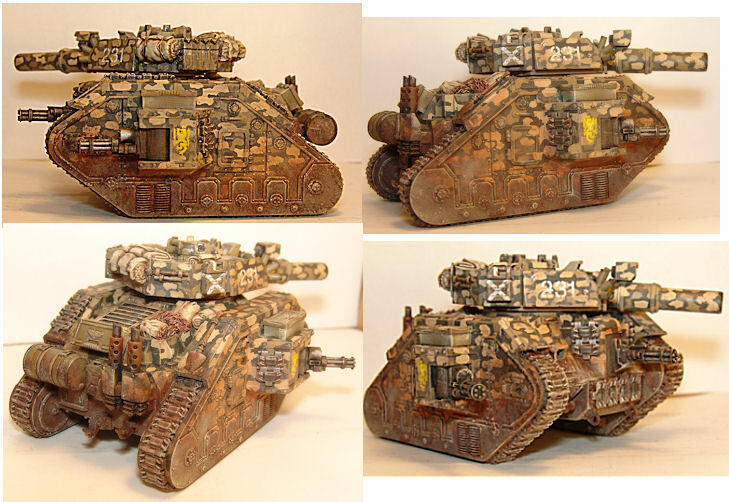 I've acquired some weathering powders and should have some pics up of the Russ soon. Between Mother's Day and the concussion, I'm a bit behind. 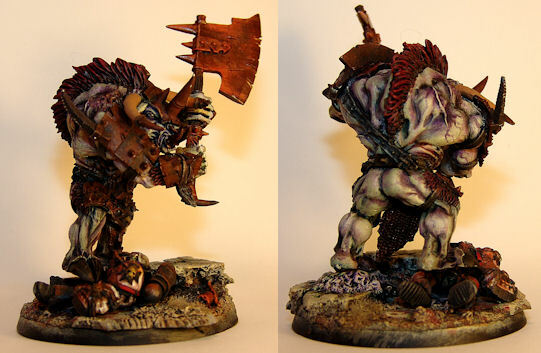 Also dusted off the Chaos army, so be forewarned.. something Nurgly this way comes. More Wednesday. Its good to be back at it. 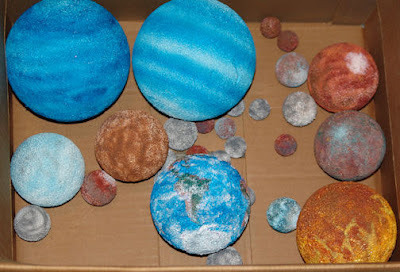 I've been working on the solar system for my wife's classroom. Here's the box o' planets. That's all for now. Detailing to go. The next update should be the finished Russ and whatever is next. Getting an itch to paint some marines for a while, just for a little change.